Minot State University’s Theatre Arts Program presents “The Chalk Circle” in Aleshire Theater April 18-21 at 7:30 p.m. “The Chalk Circle” is an adaptation of Bertolt Brecht’s “The Caucasian Chalk Circle,” adapted and directed by Carlen Gilseth, communication arts assistant professor. Gilseth’s adaptation is the tale of a young Syrian girl who unwittingly becomes the target of a life-and-death pursuit after she stops to help an infant. Pictured: Ralph Johnson, as an army corporal, and Monica Anderson, as Rasha Khalid, perform in "The Chalk Circle." Minot State University's Student Social Work Organization will sponsor “Filling the Social Workers Toolbox,” its 10th annual Spring Symposium, Friday (April 15) in the Conference Center, 8 a.m.-5 p.m. Typically, the emphasis is on prominent issues that social workers face, however, this symposium will focus on social workers themselves and creating safety for them in an increasingly volatile work environment. To register, visit www.nasw-heartland.org/event/MinotStateSpringSymp2016. To read the full news release, go to http://www.minotstateu.edu/pio/news/2016/04/sswo-symposium-focusing-on-social-workers-and-safety.shtml. Minot State University will celebrate the renowned work and life of William Shakespeare with a two-day celebration April 26 and 28. All events are in Aleshire Theater, Hartnett Hall, and are free and open to everyone. Shakespeare Fest kicks off with local musician, author, artist and MSU instructor Rick Watson performing sonnets on the guitar at 3 p.m. Following Watson’s performance, the 2008 film, “King Lear,” directed by Trevor Nunn and starring Ian McKellen, will be shown at 3:30 p.m. “King Lear” is a classic Shakespearean tragedy about family and power. Many Shakespeare lovers consider it Shakespeare’s greatest play. Eric Furuseth, MSU associate professor of humanities, will preview the movie and lead discussion afterward. Snacks will be served in the lobby. At 7 p.m., “The Merchant of Venice,” will be screened. The 2004 movie, directed by Michael Radford, is a powerful dramatic comedy in which a merchant in 16th century Venice must default on a large loan provided by an abused Jewish moneylender. Mark Singer, MSU assistant professor of history, will preview the film and lead discussion afterward. Light snacks will be provided. Shakespeare Fest continues April 28 with the film, “Much Ado About Nothing,” shown at 3 p.m. This 1993 version directed by Kenneth Branagh and starring Branagh, Emma Thompson, Denzel Washington and Keanu Reeves, centers on the romantic trials, tribulations and fun involving two war heroes who, despite an abundance of misperceptions, successfully woo the women they love. MSU Professor Robert Kibler will preview the movie and lead discussion afterward. Snacks will be served in the lobby. From 6 to 7:15 p.m., MSU faculty, along with MSU Campus Players, will present a variety of theatrical shorts from Shakespeare’s plays. 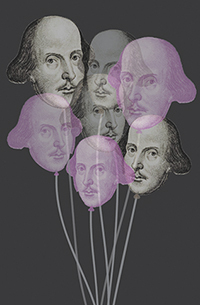 Shakespeare Fest concludes with Charles Jeffries, educator, writer and founder of Texas Theatre Consultants, presenting “Fun With Shakespeare” at 7:30 p.m. Jeffries will engage the audience with little-known details lurking about in the corners of Shakespeare’s life. Why did he insist that his workmates dress up as women? Where was he during his missing seven years? Was he responsible for the theft of an entire theater? Snacks will be served in the lobby. Joshua Boschee, North Dakota House of Representatives for Fargo's District 44, will discuss engaging elected officials on disability related policy proposals April 22. His presentation will be in Aleshire Theater, 9-11 a.m. The Minot native is a member North Dakota Center for Persons with Disabilities’ Cultural Competence Advisory Committee. He also chairs Fargo-Moorhead Pride and serves on the boards of the N.D. Council of Abused Women Services (CAWS), the Historic Fargo Theatre and the Fargo-Moorhead Coalition for Homeless Persons. NDCPD sponsors this free cultural presentation as part of its cultural competence initiative. Registration is not required. For questions, contact Becky Daigneault, NDCPD research associate, at 858-3469 or rebecca.daigneault@minotstateu.edu. The Minot Symphony Orchestra wraps up its 90th season, “From the New World,” April 23 with “A Fantastically French Finale.” The concert begins at 7:30 p.m. in Ann Nicole Nelson Hall. “The Land of Hope,” a 2012 Japanese film, concludes the Northern Lights International Film Series April 25 in Aleshire Theater at 6:30 p.m. In Sion Sono’s drama, two Japanese families are uprooted from their homes and find their lives torn apart in the aftermath of a fictional earthquake and nuclear meltdown. Vicki Michels, Department of Addiction Studies, Social Work and Psychology chair, will share research she and Amy Canevello conducted on the impact of the 2011 Minot flood in a Northwest Art Center lecture series presentation April 27 at 7 p.m. in Aleshire Theater. Canevello is an assistant professor of psychology at the University of North Carolina. “Minot’s 2011 Flood: Couples’ Growth and Coping” involved 61 Minot couples who were significantly impacted by the flood. The study results suggested that close relationships play an important role in fostering post-traumatic growth. Michels received a bachelor’s degree in addiction studies from Minot State University and master’s and doctorate degrees from the University of Wyoming in clinical psychology to become a licensed psychologist. The lecture is free and open to the public and followed by an informal reception. For questions, contact nac@minotstateu.edu. Lutheran Campus Ministry at Minot State University has received a grant of $100,000 to explore more deeply its role in helping university students reflect on faith and calling in their lives. Lilly Endowment Inc. awarded the grant as part of its national Campus Ministry Theological Exploration of Vocation Initiative to strengthen the work of campus ministries serving public university campuses. Recently, LCM hired Rev. Robyn Eddy as its vocational internship director. Eddy will oversee LCM’s Vocational Internship Program, which will place MSU student interns within five ELCA congregations in Minot. The grant funds will also finance summer camp scholarships and LCM’s Spring Break vocation trips. LCM has served MSU students for 75 years. LCM is a ministry of the Western North Dakota Synod of the Evangelical Lutheran Church in America. For the full news release, go to http://www.minotstateu.edu/pio/news/2016/03/grant-allows-lcm-to-expand-its-work-with-minot-state-students.shtml. Minot State University students in English 191: English Community Seminar read books to preschoolers, kindergarteners and first graders at Bishop Ryan Elementary School April 4. English 191, a new course within the English major at MSU, is designed to build community among students and faculty. As a course requirement, students complete a group project involving something related to the major. This semester, students decided to read to community children after practicing performative reading in the course. On March 30, the North Dakota Higher Education Challenge Fund Grant Review Committee awarded nearly $1 million in matching grant funds to Minot State University on a $2 million gift from alumnus Clint Severson and Conni Ahart. Thanks to this collaborative effort, the Severson Entrepreneurship Academy will have guaranteed ongoing support for students in entrepreneurship training. To read the full news release, go to http://www.minotstateu.edu/pio/news/2016/04/major-challenge-grant-awarded-to-minot-state-university.shtml. Minot State University welcomes Stephen Williamson, assistant program coordinator at Minot Air Force Base. Williamson is a veteran, who was stationed at Minot Air Force Base. He has a bachelor’s degree in history from MSU, and he previously worked for Magic City Janitorial of Minot. He and his fiancé, Aimee Duchsherer, have a daughter. For a hobby, he fishes. April 14-May 5 — MSU Juried Student Art Show with guest juror Justin Sorensen of Williston, Hartnett Gallery. April 15-May 13 — “Weather Forecast: American Storm,” paintings by California artist Benny Alba, Library Gallery. Brent Askvig, executive director of the North Dakota Center for Persons with Disabilities, presented a session March 30 at the “Mind Matters” N.D. Brain Injury Network annual conference in Fargo. Askvig’s presentation, “N.D. Brain Injury Needs Assessment,” explained the design and data processes for NDCPD’s work on brain injury in the state. This project is sponsored by the N.D. Department of Human Services, Behavioral Health Division. Kristi Berg and Audra Myerchin, College of Business associate professors, received Best Paper Awards at the Academy of Business Research fall conference in New Orleans, March 23-25. Daniel Ngugi, associate professor of economics, presented “Do Traders Really Know Their Customers? Evidence from a Fresh Produce Market in Kenya” at the International Journal of Arts and Sciences Conference in Las Vegas, March 21-25.